According to Statistics Finland's preliminary data, prices of old dwellings in housing companies rose by 0.3 per cent in Greater Helsinki in the fourth quarter of 2018 compared to the previous quarter. In the rest of Finland they went down by 0.4 per cent. 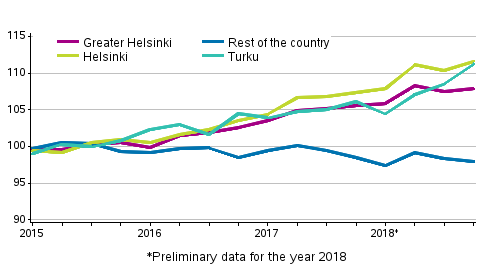 Compared with the corresponding period in 2017, prices went up by 2.2 per cent in Greater Helsinki while they fell by 0.6 per cent in the rest of Finland. The prices of old dwellings in housing companies rose by 2.5 per cent in Turku compared to the previous quarter. Compared to the corresponding quarter in 2017, prices rose by nearly five per cent. According to preliminary data, prices of old dwellings in housing companies in Turku have risen compared to 2015 as much as in Helsinki. The increase in prices in Helsinki has evened out during the last quarters. The preliminary data on the price change in Turku in the last quarter are based on 720 transactions. The preliminary data comprise, on average, two-thirds of completed transactions of old dwellings in blocks of flats and terraced houses. According to data available to Statistics Finland, 58,124 transactions of old dwellings in housing companies were made in the whole country in January to December, which is around 1,600 transactions fewer than in the corresponding period in the previous year. In Greater Helsinki the number of known transactions is now around 500 fewer than in the corresponding period in the previous year. According to preliminary data, prices of old dwellings in blocks of flats and terraced houses went up by 0.6 per cent from the previous year in the whole of 2018. In Greater Helsinki, prices went up by 2.5 per cent, while in the rest of Finland they went down by 1.2 per cent. In 2018, prices of new dwellings in blocks of flats and terraced houses went up by 0.7 per cent in the whole country. In Greater Helsinki, prices went up by 0.6 per cent and in the rest of the country by 0.8 per cent compared with the previous year. In the whole country, the average square meter price of a new dwelling was EUR 3,746, in Greater Helsinki EUR 4,917 and elsewhere in Finland EUR 3,333. According to Statistics Finland’s preliminary data, prices of old dwellings in blocks of flats and terraced houses went down by 0.2 per cent in Greater Helsinki in November to December, while they went up by 0.2 per cent elsewhere in Finland. In the whole country, the prices remained unchanged. 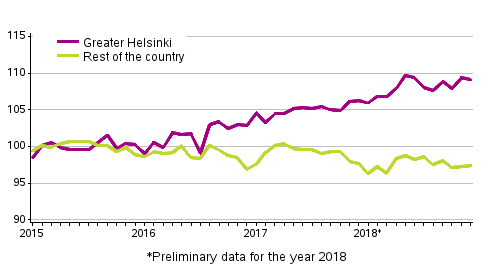 Compared with December 2017, prices went up by 2.7 per cent in Greater Helsinki while they fell by 0.3 per cent in the rest of Finland. In the whole country, prices went up by 1.2 per cent. ISSN=2323-8801. December 2018. Helsinki: Statistics Finland [referred: 26.4.2019].